Maybe it was the half a rest day yesterday, good food, proper coffee and great sleep, in a nice bed that had me in such a good mood today. Throughly enjoyed today. I got to Skype home early this morning and have a good chat with Jac (this is your 5am wake up call); had a sleep in and a nice hearty breakfast. After getting packed up I headed to the cafe next door and had a big helping of banana pancakes with loads of maple syrup – the breakfast of champions. Heading out the door and crossing the road I was immediately able to get a hitch for the 5km out of town back to the trail where I left off yesterday, out towards the Greyney Shelter. There were a heap of road works occurring to align a section of road here and I was happy not to have to walk through a section that is now down to a single lane of traffic and plenty of heavy construction machinery. Leaving Greyney Shelter the trail initially continue on the highway shoulder but soon had me down along the Bealey River following along more of the stoney gravel encountered over the last couple of days. I knew when I was approaching Klondyke Corner as there a basic campsite there that all the vehicle based campers and RV’s set themselves up. There must have been 20 vehicles all parked up. Continuing one the river flats for another 2.5km I had to cross the Waimakarri River at it’s confluence with the Bealey River. It was shoes off for this – too early in the day for wet feet. Water levels were down and the crossing was straight forward over several braids. The trail then headed back towards the road, cutting underneath the historic Bealey Hotel but I cut up towards the road to check it out and grab another coffee while I could. It was then back onto the highway shoulder for a quick 3km walk to a turn off for the Craigieburn Forest Park. It looked like a private driveway to a large farming station but there were DOC signs pointing the way. I soon the start of the track for the next section and headed up, finding a perfect walking track. It was benched, really well formed and nicely switched backed the whole way. It didn’t take long to reach Bealey Hut. Signing the intentions book I continued on, up hill for the 2 km and always climbing but the grade was perfect. Hats off to the people who constructed this track. Nice of use grade reversals and good drainage. I think they mountain bikes in mind when building. The trail lead through beech forest initially, then through a stand of ponderosa pines, back into native bush and then exiting the treeline. Views above the tree line were perfect. 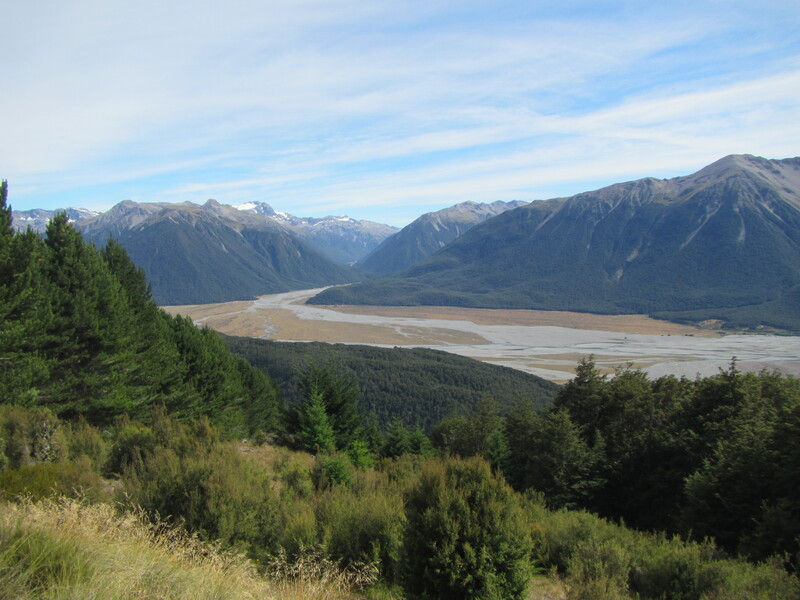 High peaks surrounding with plenty of snow still on shaded faces, a view back up the valley towards to Arthurs Pass and down along the river flats of the Bealey River. After a few quick pics and a last minute email catch up I continued, gradually climbing through alpine grasses and a few swampy sections for another 3 km, before rounding a hill to head into the Harper River Valley and back into beech forest. I hit Lagoon Saddle, a two person A-frame shelter and stopped for lunch. Fresh out of town I was carrying a block of cheese and smoked ham, such a treat after close to 3 weeks of nutella or peanut butter wraps for lunch. From Lagoon Saddle the perfect track continued on a perfect summers day. Sure there were a few steeper sections of ups and downs to reach creeks to cross but it always reverted back to the really nice stuff. There were sections along the Harper River itself following gravel beds and short sections through grass. 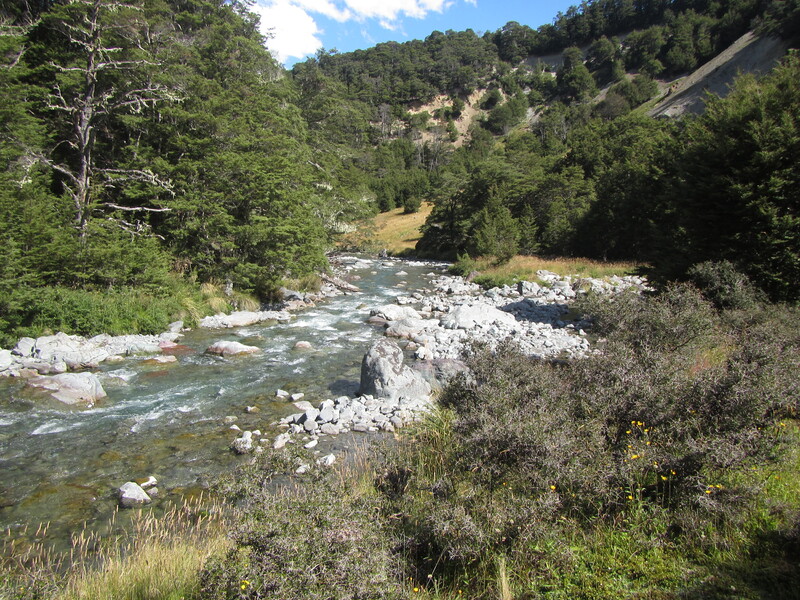 And multiple river crossings to content with as well but on the perfect day that today was, all were able to be crossed on rocks, keeping feet dry. Even the sidles were good standard where they were needed to get around large boulders or steeper ground. The trail made for fast walking. And dry feet today! Towards the end of the day both the Harper and Hamilton Rivers needed to be crossed but both had swing bridges over them. The bridge over the Hamilton looked to be very recently installed and had a timber deck instead of the typical chicken wire footing. 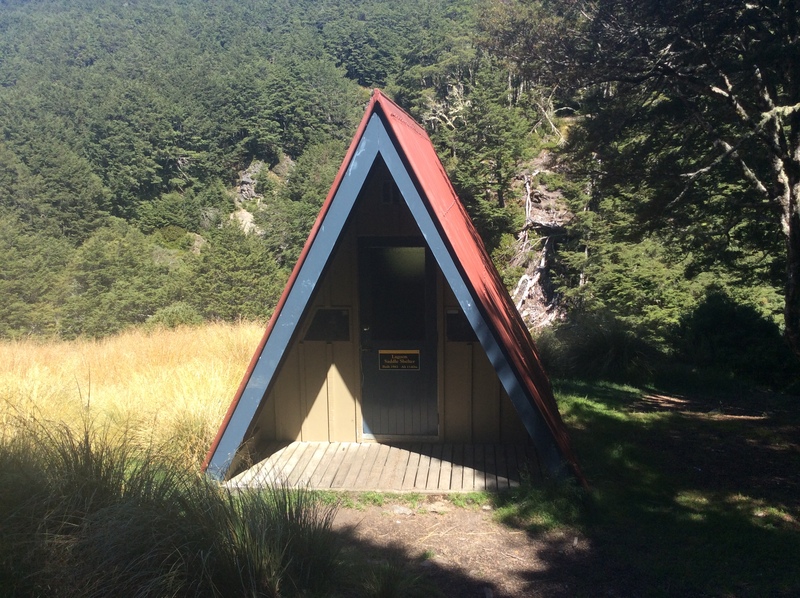 5 minutes from the Hamilton Bridge I found the perfect thing to cap of the perfect day – a perfect hut, Hamilton Hut. Immaculately clean, running water, great views and at the moment I have the place to myself.